To fully understand and appreciate that experience, it is also important to understand and appreciate the countless resources utilized in the engineering, manufacturing and testing of such a powerful machine. The cars that run wide-open at any race event, from local dirt tracks to the international super-speedways, are the product of years of hard work and research. These machines are the culmination of thousands of man-hours – both on and off the racetrack – to produce a machine that can run wide-open for more than 24 hours at speeds reaching 200 miles-per-hour. The 2016 Corvette C7.R on the starting grid of the Petit Le Mans at Road Atlanta. Of course, at the core of almost any race car is the heart-and-soul of the production vehicle from which it was inspired. While some might argue that many race cars have been developed purely for the purpose of being driven on the race track, automotive history has proved time and again that this is not generally the case. While man has always dreamed of speed, and of pushing the envelope of what is possible on the open road, most of the greatest race cars on the track today – manufactured by the likes of Ferrari, Porsche, Aston Martin and Chevrolet – evolved thru the generations of production vehicles that preceded them. While the history of any of these brands are each an incredible story unto themselves, today we look at one of the greatest production-car inspired race cars gracing the race track – the Corvette C7.R – with the hope of providing greater insight into what makes this car a winner on raceday, and to show how the anatomy of this race car evolved from its production car counterpart. 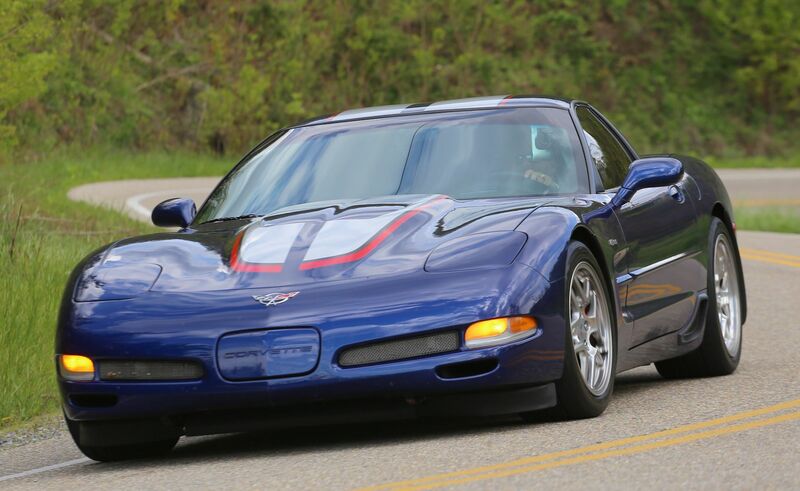 Based in New Hudson, Michigan, with an additional engineering division located in North Carolina, Pratt & Miller partnered with Chevrolet to develop the Corvette Racing program in 1999. The company, which was founded a decade earlier by Gary Pratt and Jim Miller in 1989, had already developed an incredible reputation for building high-performance cars for both the race track and all-terrain racing. 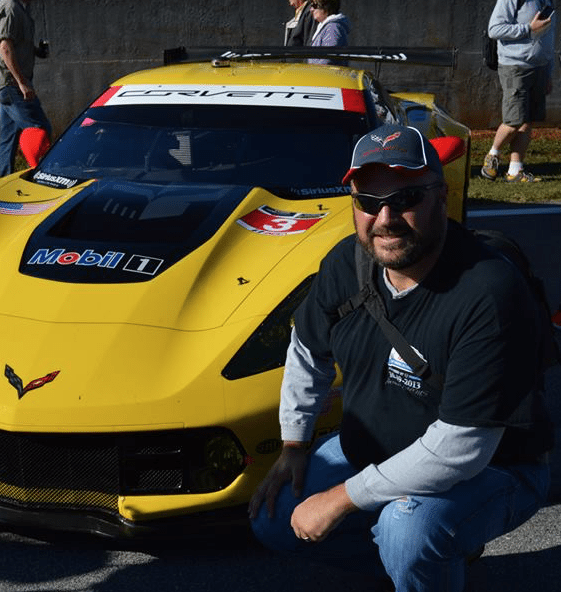 Working together with Chevrolet, Pratt & Miller have developed purpose-built Corvette race cars since 1999, and have become recognized for building some of the winning-est race-edition Corvettes in recent history. 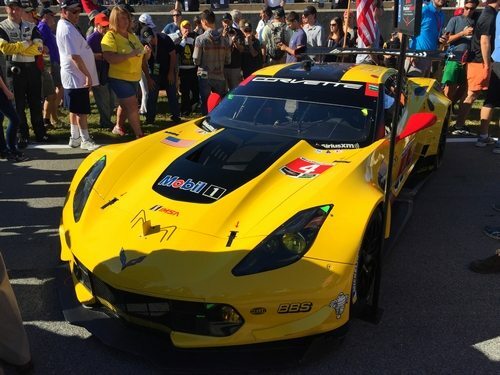 The 2016 C7.R at the starting grid of the Petit Le Mans in Braselton, Georgia. That’s not to say that the engine remained completely unchanged. Direct fuel injection, which had previously been run on the 2009 C6.R, was re-introduced to the C7.R in 2014. The direct fuel injection system allowed for more precise throttle control and also presented a three-percent (appx.) gain in fuel economy, a big enough gain to potentially eliminate one pit stop during the car’s run at 24 hour events like Le Mans and Daytona. Moreover, while the Z06 and C7.R engines may vary in size, they both share similar technologies – like direct fuel injection. 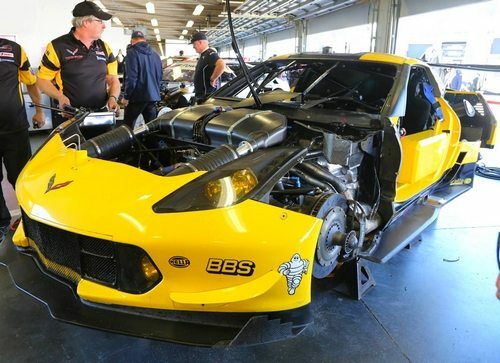 This enables the Corvette Racing team to transfer data gained from the 5.5-liter engine over to the production Corvette team, which in turns helps both teams to refine the technologies being used on both engines. 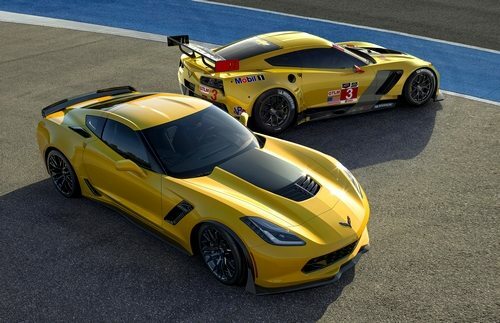 The Corvette Z06 (front) and Corvette C7.,R (rear) share more DNA than any other modern production/racing car counterparts. 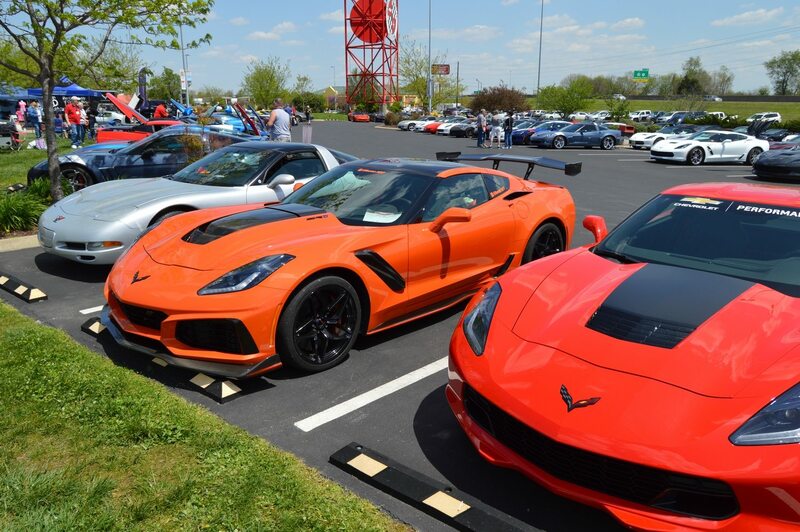 While their engines may vary dramatically, the 2015 Corvette Z06 and the Corvette C7.R were actually developed alongside each other and, as such, do share many common components. For one, many of the architectural and aerodynamic features of the C7.R race car are based on the equivalent components and technologies introduced on the 2015 Corvette Z06, including the car’s all-new aluminum frame. While the same could be said about the relationship between the C6.R and the sixth-generation Z06 Corvettes, the C7.R frames are actually fabricated at the Corvette assembly plant in Bowling Green, Kentucky, and are lifted from the Z06 production line for use by Pratt & Miller when fabricating the C7.R race cars. When developing the 2014 Corvette Stingray, the engineers at Corvette lifted many of the aerodynamic strategies directly from the Corvette C6.R – including the forward-tilted radiator, functional hood and front-quarter panel vents, the rear-mounted transmission and differential cooling intakes. Development of the Z06 and C7.R took that aerodynamic foundation and evolved it, sharing technologies that improved engine cooling and aerodynamic downforce, including similar front splitters, rocker panels and front- and rear-brake cooling ducts. While there can be no question that the Corvette C7.R and the Corvette Z06 share the closest link in modern times between Corvettes built for racing and the road, there are also a great many characteristics about the former car that separate it from the latter. While production Corvettes offer either a seven-speed manual or an eight-speed automatic transmission, the C7.R utilizes a race-designed six-speed sequential manual transmission. The Corvette’s traditional transverse composite leaf springs are replaced by adjustable coil-over strut assemblies developed for track duty. Racing rules dictate that iron brake rotors must be utilized on all race cars. By comparison, the Z06 utilizes carbon-ceramic brake rotors. Moreover, the rear brake calipers on the C7.R feature a six-piston caliper that match those used on the race car’s front wheels. While some Z06 owners may elect to upgrade their brakes to such a configuration, it is a far more robust braking system than any production Z06 would ever require, except maybe during the most extreme track-racing conditions. 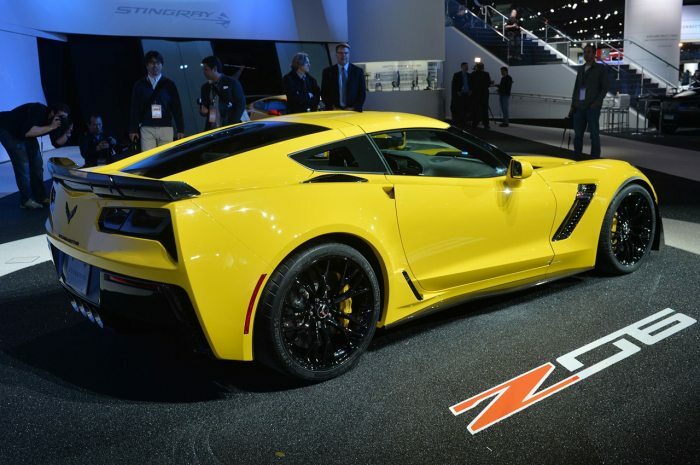 Where the Corvette Z06 rides on 19-inch front and 20-inch Michelin Pilot Super Sport summer-only, run-flat tires, the C7.R rides on Michelin-racing tires, and all four wheels are the same size at 18-inches (front and rear.) The C7.R tires are also considerably wider, measuring in at 12.5 inches wide in the front, and 13 inches wide in the rear. at night during the 24 hours of Daytona. But while these differences in mechanical components and their ability to slingshot the Corvette to top speed or bring it to a grinding halt are significant, the greatest differences are in how the car looks and, even more so, how it sounds. 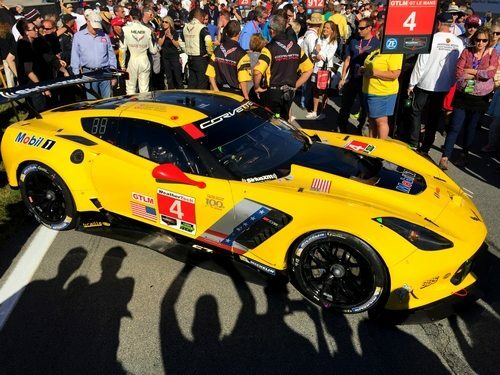 Sitting on the race grid, a Corvette C7.R looks squat compared to a production C7 Corvette Stingray. That’s because it is. If you’ve ever climbed into the cockpit of either a C6 or C7 production vehicle (any iteration), you’ll note that these cars are low and require a little finesse to climb in-to and out-of. 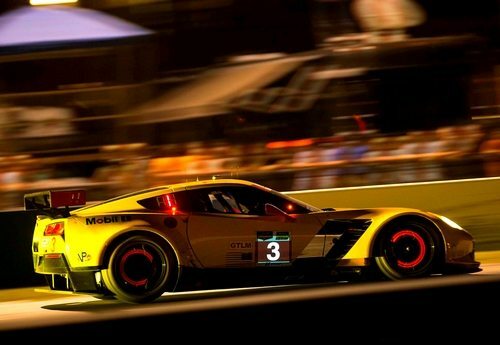 The C7.R Corvette takes it a step further. The race car’s roof line sits at just 45.3 inches from the ground, a full 3.3 inches less than the production cars. In addition to being lower, these cars are also wider. Coming face to face with a C7.R can be intimidating. The car sits 80.7-inches wide at its greatest width (at the rear axle), which is nearly five full inches wider than the current Z06 and 6.8 inches wider than the stock C7 Corvette Stingray. But what about the sound you ask? As you might recall at the beginning of this article, we said that the sound of a race car engine is almost impossible to define. Yes, it’s loud, unrestricted – the byproduct of a 491 horsepower, beefy-V8 pushing exhaust away from the-almost-red-lined engine thru muffler-less pipes while running wide open at 6,000+ rpm’s. 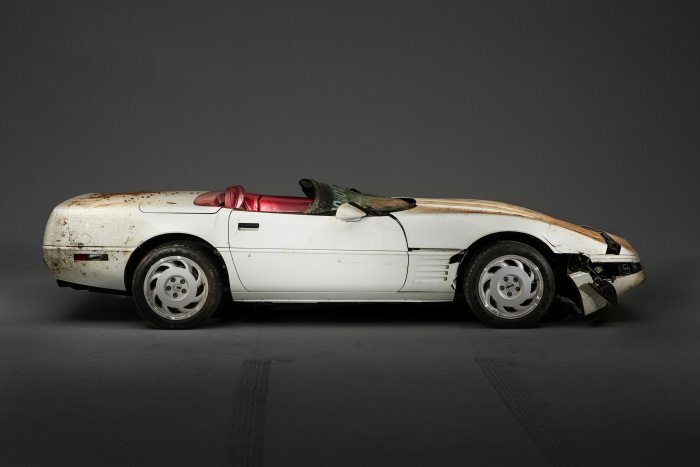 But more than that, it’s distinctly Corvette – the deep, chest-rattling rumble and the rifle-shot backfires as a driver downshifts the car while entering into a sharp turn or tight corner. Its power – raw and unadulterated – the likes of which most of us will never experience when sitting behind the wheel of any vehicle. It’s the thunder and the lightning, rolled into the powerful heartbeat of an American race car – the Chevy Corvette C7.R.